Everything Just So: Is Fur Back? 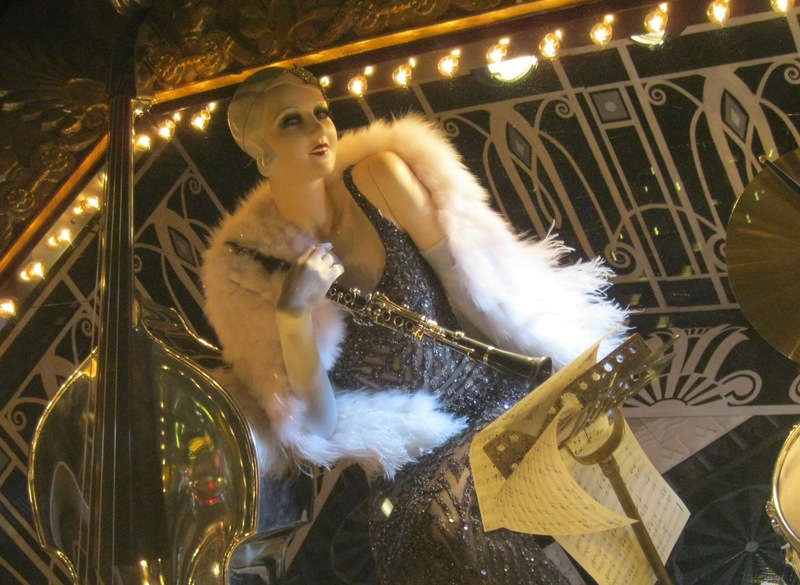 A Jazz Age gal in a J. Mendel fur, from a 2012 Bergdorf holiday window. Maybe I should be asking, Did fur ever go away? Because I had assumed it did. It seemed for awhile if you were caught in public wearing a fur coat of any kind, someone from PETA might be very close by, willing to throw red paint your way to make the point that killing an animal to make a coat out of its fur is unethical and unacceptable! Or maybe that was just the way the media spun it. But between the holiday windows at Bergdorf Goodman this past year (okay, maybe every year), and a few ads and editorial spreads I saw in a recent Harper’s Bazaar, I have to wonder if fashion editors and merchandisers have just decided to get on with it and feature some fur, PETA be damned. For instance, Anna Wintour, Editor-in-Chief of Vogue, wears a fair amount of fur and she doesn’t seem to be heckled for it or have any pangs of conscience about it. Anna in a white shearling coat. Photo by Gareth Cattermole. Side note: I want a cute young man to hold an umbrella for me too. I don’t know if I have an Official Opinion regarding fur. I don’t own any, save for a collar I picked up from a neighbor who had draped it over her gate, hoping to pass it on, and I can’t work up the guilt about owning it since it’s a vintage piece, probably from the 1950s or 60s, when I think fur was a lot more acceptable than today. I am not vegetarian and I do wear leather shoes and carry leather bags. I will be honest and admit I find the fur coats Bergdorf shows in their windows every winter jaw-droppingly gorgeous, however if I had that kind of money to spend, I would take it right to Cartier for some pavé diamond jewelry, I would not be buying a fur coat! A gorgeous fur coat by J. Mendel in a 2014 Bergdorf holiday window. Stunning! 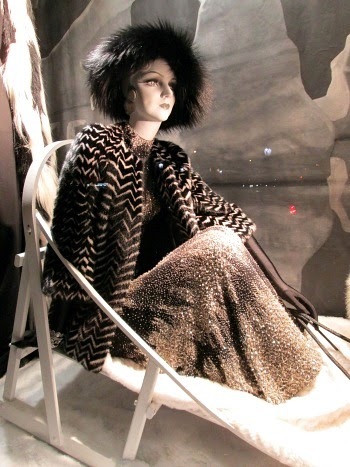 Another fur (probably J. Mendel) from a 2011 Bergdorf holiday window. From the Dec 2014/Jan 2015 issue of Harper’s Bazaar. Photo by Jennifer Livingston. From the same issue, an advertisement for fur coats. Detail of a fur collar added to a J. Crew coat, from “How I Wear My: Coat,” January 2014. I do think there are some really pretty and glamorous faux fur options out there so if I had my eye on that kind of look I would definitely be buying faux. Do you wear fur or are you opposed to it? I've got conflicting opinions on the matter. I agree that it can indeed look very glamourous, but sometimes a bit gruesome (I'm picturing those coats where you can see many, many individual pelts stitched together... ick!). Sometimes it also feels a bit gruesome, I've touched coats where you can feel the hardened skin under the soft fur, and it makes my own skin crawl. I have no reason to wear it myself, living in a warm climate, but I appreciate that it is very practical for truly cold weather. As for the ethics, well, it's certainly not nice but I do feel the world has bigger problems to sort out before worrying too much about fur. I inherited a vintage 1940's coat from my great aunt Tirzah and wear it when it snows. I feel there is a stigma with real fur and yet I eat meat and like you I carry leather handbags and only buy leather shoes....it is a real conundrum. I think you'll get lots of comments on this post so I will pop back and check in to see what others have written. I have a silver fox and a rabbit fur coat that I bought at consignment stores. I love them but am bothered some when I think about their origins. I live in the mountains where furs are normal and do keep you warm. I don't wear fur and don't hunt for the same reasons but do I not take a harsh view for those that do. Deer hunting is needed to keep populations down in some areas or else they'd all die; I don't know much about how furs are acquired but don't like the idea of an animal caught in a trap and enduring prolonged suffering. Nearly all my available outrage is directed at Islamic Extremists and what they're doing to the world. Pardon the typo as it should be: "I do not take a harsh view to those that wear fur or hunt". Nothing feels as luxurious as real fur, I do wear it. I think there have been enough protests so that they no longer trap animals in the wild, which is painful to the animal. I think that all of today's furs are bred on a "ranch". The same concept as for cattle (I eat meat and wear leather). Also, I love that coat on AW and would gladly hold an umbrella for her. Jill love that collar and coat on you too! Where I live, it's never really cold enough to warrant wearing fur. Even if it were, I could no longer consider purchasing real fur. Yes, it's beautiful, and yes I still eat meat occasionally and wear leather, but after some of the horrible things I've read about the treatment of animals either trapped or raised for fur, it's easy for me to pass up, especially with so many great faux options out there now. Even if I were not to wear the real thing I would never wear faux. There is no comparison. It would be like wearing polyester instead of silk. Better then to wear wool, etc. I def think vintage would be the way to go if you are into fur. I eat meat and wear leather, but it's the cruelty of the industry that stresses me out. Although, the industrial meat & poultry industry is also quite horrid. It's awful to think about it. I need that hot umbrella-holder guy, too! I love fur, but only vintage or faux. I can't see myself buying a new, real fur anything. Like you, I do wear leather shoes and carry leather bags, but I just can't do fur. In part, I think because I'd rather have vintage. And because faux fur has come quite a long way in feeling/seeming real, even at lower price points. Faux leather, on the other hand, usually looks/feels like cheap plastic except at the higher price points. Because you asked for my opinion Jill, all I will say is that I am a born and raised Texan and I have worn real fur. I wrote a feature last year on the Saks Fur Salon and the coats were so incredibly gorgeous and I would wear them. I love animals and care for mine, and I also wear fur. But, I also respect the opinions of those who don't. Fashion is so great to offer options. Yes, there is no baby in our house yet. If she doesn't deliver by Monday, she will be induced on Tuesday. Thanks for asking...we are all going a bit nuts down here! I live in Canada; which was founded on the fur trade. I have never be harassed nor feared wearing fur. Fur trapping is regulated and no endangered species are hunted or trapped. Many people in remote communities depend on the trapping, for food as well as earning money from selling pelts. I'm surprised AW was wearing a fur in the rain. That is a no no. I isn't appropriate; or good for the fur. If there is rain in the forecast, I would never wear a fur, even if I had ten men with umbrellas walking with me. I'm not opposed to wearing fur but I wouldn't buy it for myself. It doesn't get that cold where I live to warrant wearing one. I enjoy faux fur as accessories, and I don't have to worry about any special care or precautions one makes for real fur. It could be back a little more, I'm not in a hurry to wear it unless I'm sure the animal added to life as much as possible. I am not a fur fan at all but I'll take the cute young man holding the umbrella.